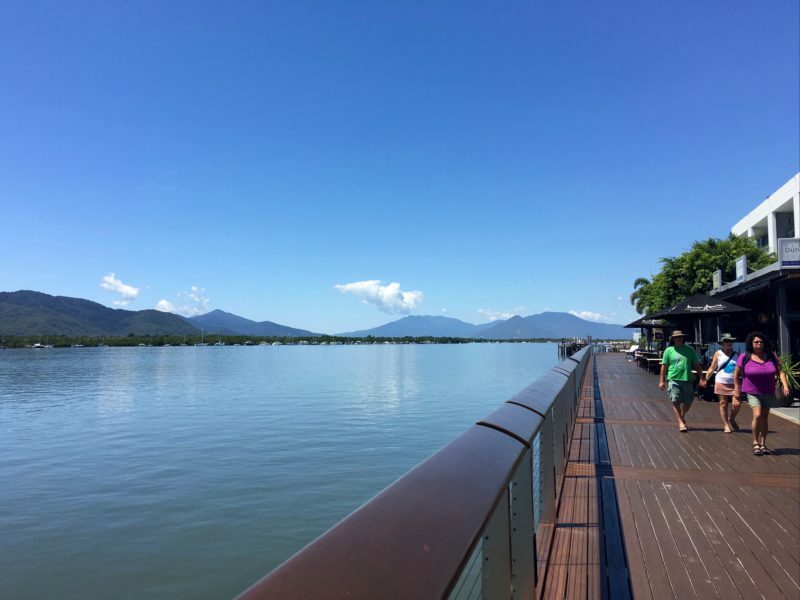 This magnificent tropical tidal estuary is home to such a diversity of fish, over 40 species are readily encountered, and is only 2 minutes away from the heart of Cairns. 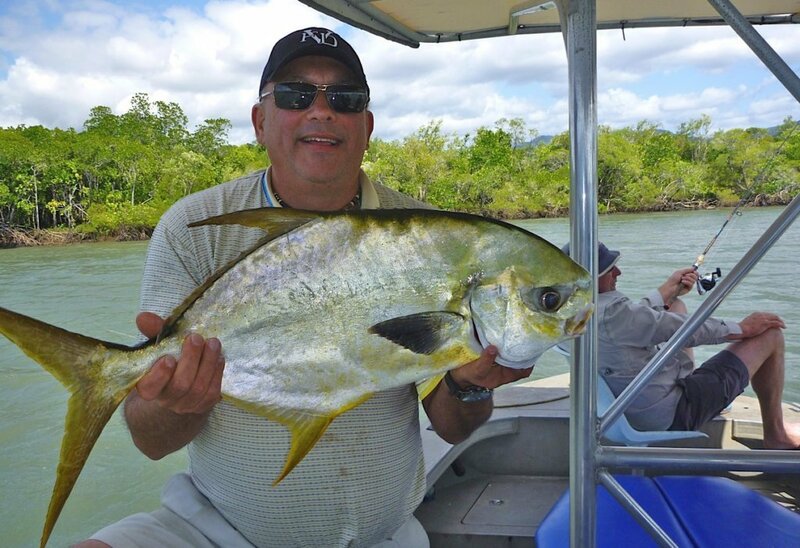 Over 90kms of winding mangrove lined waterway is accessible to the enthusiastic boat angler. This waterway is primarily a huge tidal basin with no actual river flowing into it, and offers almost year-round action. It is also a Fish Habitat Reserve, having been recognized for its unique quality and importance in the natural scheme of things. It is a prime fish breeding and nursery area and is the reason why so many juvenile fish are caught in its waters. Baitfish and succulent prawns abound and the handy use of a cast net is all that is required for the angler to begin that fishing outing. See our Bait section for more information. Our tropical region has hugely varying tides. From highs of over three metres and lows of approximately 0.2m around our spring full moons, the resultant tidal surge can even make anchoring a difficult exercise. While the neaps around the first and last quarter of the moon can see only three inches of water movement. Understanding this water flow and its effect on bait and target fish is the key to understanding the fishing potential of this system. And then you have the vagaries of the wet season where up to a metre of rain can fall in a few days flushing bait and fish out to sea. Local knowledge is paramount, call into a local tackle store, ask a few questions and top up your tackle box. One of the golden rules of estuary fishing is to fish the deep water on slow moving tides, fish shallow water on fast moving tides. Secondly, follow the tides up and down the system. If you commence fishing with only one hour left of the run out tide it is probably not too wise to motor 5kms up to the top of the main harbour. 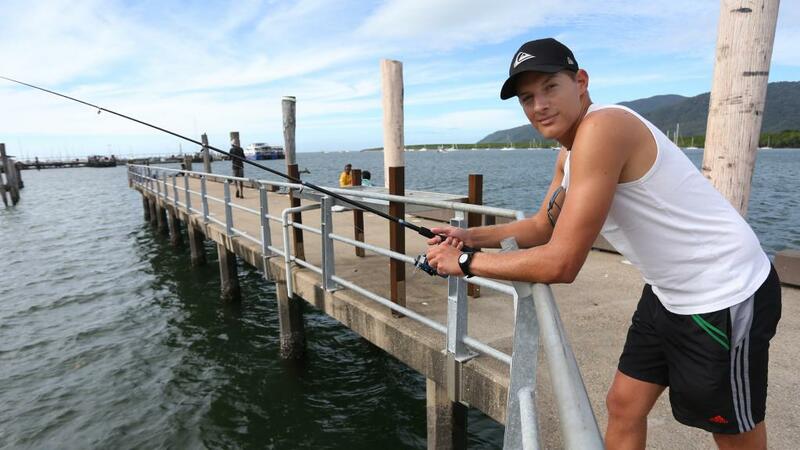 Wiser to fish the region near the entrance of the harbour and target that first run in as well. Both prime fishing times. The third rule is that the most productive fishing time is usually the one and a half hours either side of high and low tide. Rule number 4, the run in tide seems to produce better fishing results. If you analyze the above you will soon be able to calculate that prime fishing time for you to be on the water. This system also varies greatly in water depth. It is not possible to “read” this depth without the aid of a good quality sounder and the purchase of this equipment is a must if you intend to fish successfully. Various fish species are also more prolific at different times of the year. This is due mainly to the water temperature which can be a warm 28°C+ in the summer, but drop to a cool 18°C during winter. 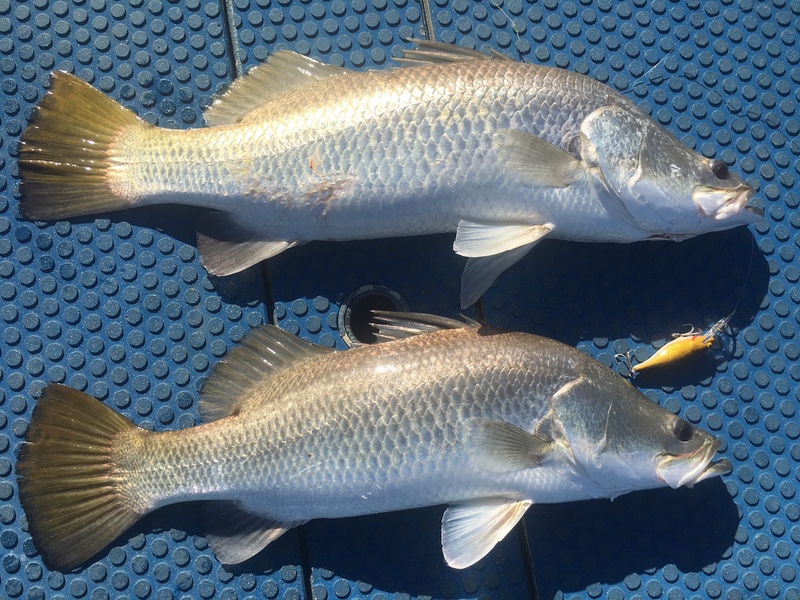 Prime summer species include Barramundi, Mangrove Jack and Fingermark, while GT’s, Queenfish, Flathead, Estuary Cod, Bream and Grunter are more prolific during the cooler months. These fishing times also coincide with fish breeding cycles and this fact should be considered by conservation minded anglers. Take only what you need for a decent feed. These two prime groups of fish also prefer slightly different locations within the system. The summer targets are predominantly structure orientated fish, while the winter species are more mobile, moving throughout the system on the tides but with a preference for gutters and channels. Using this information as a guide, the deep holes (fished on the neaps) are located in front of the Sugar Wharf terminal, out from the Bark Hut, at the mouth of Redbank Creek, and near the region known as the Five Ways (the junction of Smiths, Garrison, 4 Mile and Chinaman Creeks). On the fast flood tides fish the shallow water at the mouth of Wrights creek, the southern bank of Redbank Creek, the Eastern side of the main channel and the flats out from the Cairns Esplanade. These flats also hold one of the most important structures of the whole system – the old submarine boom. Stretching from the eastern side of the entrance flats right across the harbour to the Cairns Esplanade, it has now become a living artificial reef that holds surprisingly good quality fish. 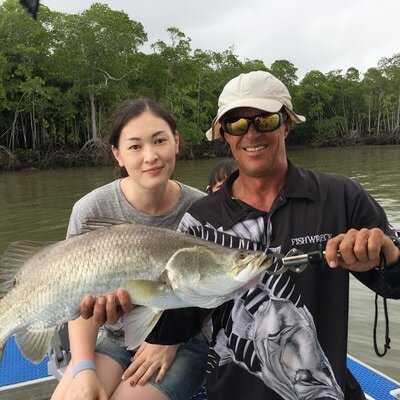 From prime Barramundi and Fingermark fishing during the summer months and calmer winter days, to hordes of big Bream, Estuary Cod, Trevally and Queenfish during the cooler winter. This location should be the number one target area when medium tides and mild weather conditions are encountered. Either side of this area can also produce King and Blue Salmon on the incoming tide, but is only really productive on calm fine days. 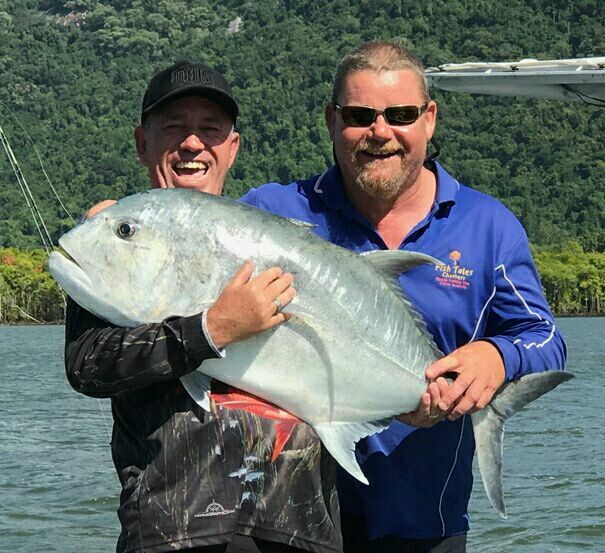 Big grunter will also patrol these flats on the huge tides associated with our full and new moons and large strip baits are preferred here using a standard running sinker rig. This system is huge and weather conditions also play a major role in anglers comfort and fishing success. Our prevailing weather comes from the South East and winds can blow from this direction at 25 knots for days on end during the cooler months. Seek locations out of this wind during these periods, either hugging the mangrove lined channels, the eastern side of the main harbour, or up in the Smith creek region. During the summer look for structure that hold Barra, Jacks and Fingermark. Wintertime is the time to fish the gutters and drop offs for Trevally, Queenfish, Grunter etc. Fish deep water during the slow moving tides, shallow water on the big fast moving tides. Use fresh or live baits and match hook sizes and rigs to reflect the target species and its location. CAUTION: Care should be taken when fishing in all of our tropical coastal estuaries and river environments. Crocodiles are present in these systems all year round and the foolhardy angler could place themselves in extreme danger. Never swim in unsafe waters, do not fish from the bank nor clean your catch on the waters edge. Box jellyfish are also prevalent during the summer months. Their tentacles can reach up to three metres long and hold millions of tiny poisonous barbs. They can kill, but even a minor incident can leave severe scars and welts on unprotected skin. No known antidote is available but if stung, immediately apply vinegar liberally to the affected area. This will neutralize their firing mechanism enabling the safe removal of any tentacles or tentacle fragments. Seek urgent medical help as respiratory failure can occur within a relatively short time.